Many of our clients have shed bases or areas of concrete that they want to put a shed onto but the concrete either wasn’t laid flat to start with or it may have settled over the years. Many shed companies will use bits of packing to try and get over this problem. If the shed comes with a floor it may be that, like our sheds, the floor was designed to go onto a firm, level base. The problem is that these types of floors do not take to being packed here and there. It can leave the floor supported very well around the perimeter but with little or no support in the middle. The solution is to use a suitable, heavy duty floor frame and support it properly throughout. Gorilla Garden Sheds can do that for you as part of your garden shed project. The frames are made from pressure impregnated C24 graded 4 x 2 timber which is assembled on site using special coarse screws which are construction rated. 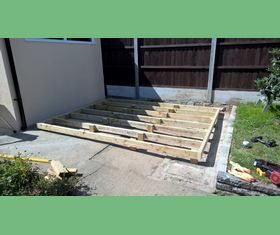 The frame is then laid onto the base and levelled all the way round. Once it is levelled and supported we measure and cut pressure impreganated legs (28 of them on a 10 x 8 floor) for the frame which are then attached to the frame with thixotropic adhesive and screws. The frame is then clad over with 18mm exterior plywood. The shed is then assembled straight onto the floor. The cost for this is dependent on the size of the shed: the bigger the floor, the more it cost. As at January 2016 the cost for this on a 10 x 8 shed is £143.72, a lot more cost effective than tearing up the concrete and renewing it. This style of floor frame is also recommended if you are laying a lightweight plastic base such as ecobase. As it will be going onto your ready prepared and levelled plastic base system it will not need the legs so the cost is reduced.